This is all well and good, but I seemingly cannot go any lower in detail. True, I could have made Scandinavia a Category, and that would have allowed me to have cities/sites within each country being assigned Tags. However, since any given photo can be assigned multiple keywords (categories, sub-categories, or tags), I don’t have to stay in a strict outline. For example, every picture I took in Copenhagen will be given a Tag, “Copenhagen”. It will also be assigned a Tag, “Denmark”. I am still in the process of defining/assigning these lower level keywords to my Scandinavian photos, but the figure below will give you an idea where I am going. One could argue that better way to do this would be to make the Scandinavia trip a Category. That would give me the ability to assign countries as Sub-Categories, and cities/sites to Tags. But in my case, I long ago established the practice described above. That being said, there is nothing stopping me from changing my basic approach at any point, or even redoing what I have done for previous trips. However, the important thing here is that whatever structure you do choose to use, the acid test is can you quickly find that one picture you are looking for. I can do that. If I have any idea what I am looking for, I can find that picture in my Catalog within one or two minutes. 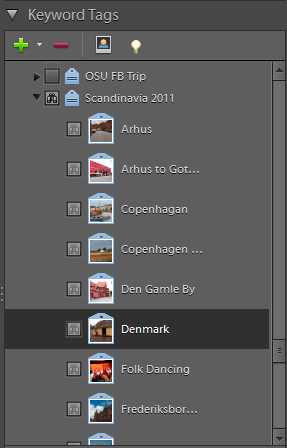 Currently, I am working through my Scandinavian pictures, rating them and assigning keywords to them. Some I remember exactly what they are and where I took them. However, I have to admit there are many many photos I took that I cannot remember exactly what I took or why I took them. Obviously, I need that type of information to assign my keywords. I am using a variety of information to identify my photos. The time stamp on each photo plays a major role here. I am using the tour’s itinerary to correlate with this information. I’m also using Google, searching for images of the many castles, churches, palaces and other landmarks we visited or quickly drove by. Not all of these get a keyword assigned, but I will try to get the major ones identified and tagged. I also use maps. What I am not using are my notes; I don’t have any. I did travel with two friends, Tom and Judy. Judy took extensive notes, which she is going to make a copy for me. She is my ace in the hole to fill in the blanks. I’m sure I will think of things I left out of this post, and will try to include them in a later one. But in the meantime, please exercise the Like button and use the Comments for any questions or comments you may have. Reviewing again where I am in going through the 1400 pictures and video clips I took on my Scandinavia trip, I have uploaded all of them to the PSE Organizer, assigned them a top level keyword tag, and backed up the Catalog. These steps were described in previous posts of this series. Now the more interesting tasks begin. The first thing I generally do at this point is go through the pictures and rate them. Because I have so many photos I have just imported, I am working with a day at a time. I have told my students many times that I do not delete any pictures I have taken prior to importing them to the Catalog. That is generally what I did on this trip. The 1400 images I returned with pretty much represent each time I pressed the shutter. The primary capability I use of the Organizer is viewing the image or images in the full screen mode. A quick way to access this mode is to press F11. I also make the the filmstrip on the right hand side visible. It is activated by selecting the filmstrip on the Control Bar that pops up when you are in the FS mode. One nice feature of viewing the images in this mode is that you can zoom in to check their focus. The figure below illustrates this. I rate the pictures as I’m working my way down the photos in the filmstrip, clicking on each thumbnail in turn to display the image full screen. PSE provides a 5-Star Rating system. My definition of what constitutes a give star rating changes from time to time. I do not consider these ratings fixed in concrete, nor do I rate each and every photo. Here is how I am doing it for this trip. It is basically what I normally do. 5-Stars: An extremely good photo. 4-Stars: A very good photo. These are often the ones I make a large print from. 3-Stars: These are pretty good, and will be the ones that I will put into a slide show, at least initially. Often, they are not that good, but I need to include them to tell the story. Obviously, the 4 and 5-star photos are also included in the first iteration of a slide show. 2-Stars: I give this rating for two different reasons. First, those 2-Star photos are candidates for becoming examples I use in my photo classes. They have problems that can be corrected using techniques we are learning in class. 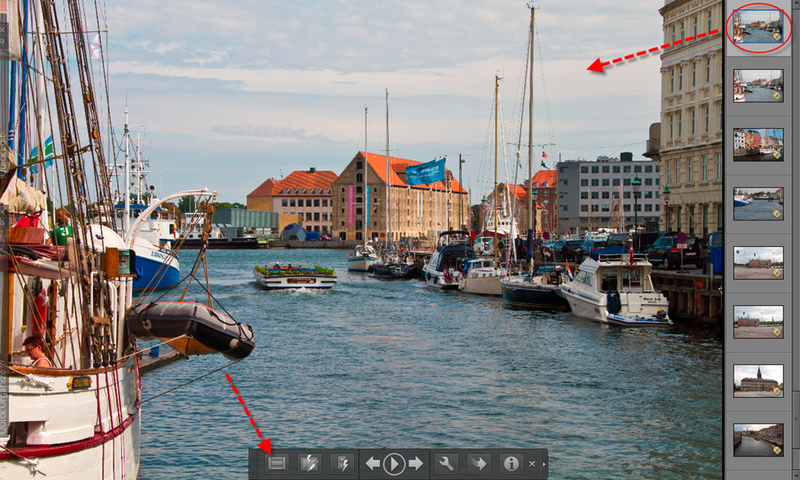 The second entirely different reason for assigning a 2-Star rating is to identify those photos that are part of a panorama sequence or an HDR sequence. It is often difficult to locate these sequential pictures in the main Organizer thumbnail view. 1-Star: These are the photos I will delete. Generally, I delete those with a 1-Star rating as soon as I exit the full screen mode. Some pictures may be given a 1-Star rating because they are essentially duplicates of other pictures. However, for this trip I will not delete them right away, just in case I want to keep a few of them. When I delete images in the Organizer, I always delete it from the hard disk as well. The mechanics of assigning Star Ratings while in the full screen mode are simple. Simply press the key that reflects the rating you want to assign. However, be aware there is about 2-3 second delay after you press a number before PSE is ready to accept another command like clicking on the next photo in the filmstrip to display. When I am all done rating a batch of photos, most of them have no rating. I probably won’t use them in the near term, but they remain in my Catalog for potential future use. When I come across multiple shots of the same subject I will often display two images side by side by pressing F12. This really helps in determining which one to keep. That’s about where I am now. In the next post, I’ll describe how I am adding lower level keyword tags. Please click on the Like button if you are finding these posts interesting or helpful. Also, please use the Comments to ask any questions, feedback, or a description of how you go about weeding out your images. This will be a very short post. I am only covering it now to impress upon you how quickly I backup my photos after a major photo shoot like my trip to Scandinavia. If you have read the previous posts, you know that up to this point, I have imported all of my images and videos to the Organizer. I have also tagged them all with my top level keyword. In my case it is the Sub-Category, Scandinavia under the default Events Category. I uploaded my photos and videos on Tuesday and actually backed up the Catalog containing the photos on yesterday. I will back up my video Catalog tonight or tomorrow. This is usually about when in the process I do a backup. As of right now, my photo images are in three places. They still are on the memory cards, in my prime Catalog, and in my backup of my Catalog on an external hard drive. As is my standard practice, I did a full backup using the Organizer’s File > Backup command. The backup folder was 271 Gb. The backup process took about three hours to complete to a USB 3.0 external drive. I have two backups on this drive, one completed earlier in the month the one I did yesterday. In Part 3 I will describe how I rate my photos. In my last post, I said I would cover uploading the pictures and video I took with my iPhone. I will, but first I want to digress a bit. I over estimated the number of pictures/videos I took on this two week trip. I have uploaded all of the pictures and videos I took with my Canon 7D and iPhone to the PSE Organizer. As it turns out, I took 1320 pictures, which were mostly RAW images. All but a very few were taken with the 7D. Additionally, I ended up with 80 video clips taken with either the 7D or my iPhone. Number-wise they were equally split between the two cameras. I mentioned previously that I took my iPad partly to backup my pictures from the 7D, which I did except for the last day’s pictures. I also took it to email home pictures from time to time. The only way I can connect my iPad to the internet is via a WI-FI link, which was available for free in each of our hotels. I also had purchased an international data plan for our time in Scandinavia. However, what I failed to consider was the fact that shooting RAW images for the most part made for large files, and the need for the recipient to convert them in some way to be viewed. I do not have an app on my iPad that can convert to JPEG. As a result, I did not share as many photos or the best photos. Most of the photos I emailed were from my iPhone’s 5 Mp camera. I uploaded all of my pictures and videos from both the iPhone and Canon 7D today. I will discuss both media types together, since my process is the same for both. I’ve had my Canon 7D for a little over a year now. After using it a bit, I decided to use a separate catalog for its video clips. This does complicate the process a bit. I have to upload the contents from each card twice, once to copy all of the pictures I took and a second time after opening the second catalog to upload the video clips. Fortunately, the Organizer has a way to make this easier than it sounds as shown in the figure below. You can hide either video or still images during import. When you do this, only the media type you are not hiding is uploaded. As is my usual practice, whenever I upload a major group of pictures I tag them with a Sub-Category or Tag as soon as I import each batch. I then come back in a later step of my workflow to add more detail to my tagging. My practice is to identify each of my major trips under the default Category, Events as either a Tag or a Sub-Category. So, for this trip I made a Sub-Category under Events named “Scandinavia 2011”. I will discuss my approach for other tags in a future post. Some might argue that I should have used the default Places Category instead of Events. If I had it to do over again, I might do that myself, but that’s how I am doing it now. Upload pictures from the card using the built-in card reader on my PC. Tag the images with the Sub-Category “Scandinavia 2011”. upload the video files on the card. Note, these are put into the same physical folder automatically by the Organizer, even though they are in different Catalogs. Tag the video clips with the Sub-Category “Scandinavia 2011” under the default Events Category. Generally for my video Catalog, I will not tag the clips to as low of level as I do the images. I did the above for each of the 5 cards I used on the trip. That is pretty much where I am as of now. I did have to do one more thing for the pictures and videos coming from my 7D. There is a nine hour time difference in Scandinavia, and I forgot to set my camera until day three. So I had to change the time for all of the pictures I took on the first two days using the Edit > Adjust Date and Time of Selected Items command. This was not hard, but I wanted to do it right away. Pictures and videos from my iPhone always had the proper time, since it is automatically sets the time. I am anxious to look at my pictures in more detail, so I will cover how I go about rating the pictures in Part 3. Later, I’ll return to more detail tagging. For now I can quickly access the photos using the Sub-Category “Scandinavia 2011”. Remember, don’t hesitate to Comment and Rate this post. Also, I noticed a few of you have subscribed to the blog. I would encourage you al to do that via the RSS button at the top of the page. That way, you will get notice whenever I add a new post. As I said in my previous post, I will be posting a series of articles describing how I go about dealing with a large number of photos and videos that were taken for a specific event, in my case a two week trip to Scandinavia. I originally intended to upload this initial post yesterday, but better late than never. I will attempt to add additional posts shortly after I do specific tasks, so that you can get a feel for how long it takes to go from step to step. I cannot string this out too long, because classes start in a few short weeks. First, let me fill in some background information. On the trip I used my Canon 7D DSLR camera to take both still photos and video clips. The total number of pictures and videos I took on the trip was about 1500+. I’ll update this number after uploading them into PSE’s Organizer. The vast majority of the still images were RAW files with a few JPEGs. All of the video clips are 1080p HD MOV files. I also took some pictures and video with my iPhone 4. 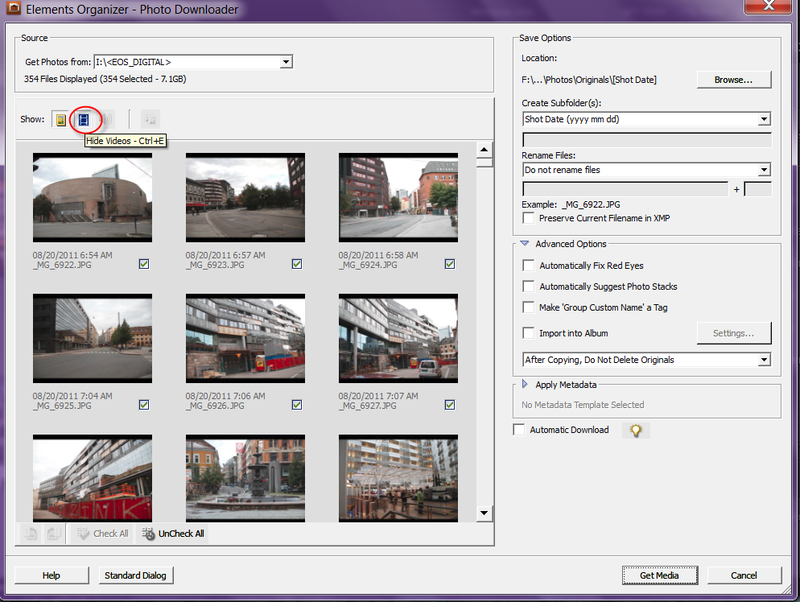 These files broke down to about 72 still images from its 5 mega-pixel camera and 28 video clips. I took my iPad with me and backed up all of my 7D files to it, except for the last card. On the trip, I filled up two 16 Gb cards and about 2-1/2 8 Gb cards. So you can see I came back with a lot of media to organize, edit, and ultimately share in a variety of ways. By the way, two days before leaving for Scandinavia, I just returned from a backpacking trip in the Sierras that I have had no time to organize or work with yet. In the next post, I’ll describe the uploading and initial organizing of my images and videos I took with my iPhone. Stay tuned. By the way, if you are finding this series interesting and/or helpful, please comment and rate it. Thanks. IF you were in one of spring classes, you probably know I was going to Scandinavia this summer. Well, I am about two thirds if the way through my trip. I decided to post a short note to apologize to any of you who may have left a comment or question during the past three weeks. I will definitly reply just as soon as I return home in a few days. Also, as you probably suspect, I am taking tons of pictures and videos. I have a very big job when I return home, organizing, documenting, editing, and ultimately sharing these pictures and video clips. Look for my first post on August 22nd. By the way, I am posting this note using my iPad, so please the typos that may hacve crept in.